When you think of ginger, what’s the first thing that comes to mind – Thai food, Indian food or ginger snaps? Ginger’s great flavor has helped it to become one of the most used spices in the world. However, its popularity also has a lot to do with its medicinal properties. That’s right, with ginger you get a ‘2 for 1’ impact, it’s tasty and has health benefits. 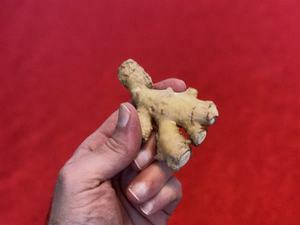 What is it about ginger that compels me to write an entire article about this popular spice? The answer, gingerol, the oily resin in ginger that acts as a powerful antioxidant and anti-inflammatory agent. In other words, exactly what we need to stay healthy and disease free! Heart Health… One of the biggest threats to our health is heart disease. Research suggest that ginger is helpful in lowering cholesterol and triglycerides as well as normalizing blood pressure. Combine ginger with a low-salt diet and you’re well on your way to becoming heart healthy. Some studies have shown ginger to slow blood clotting, so make sure you talk to your doctor if you are already taking a blood thinner like Warfarin or Plavix and would like to use ginger daily. Pain Management…As a natural anti-inflammatory, research has indicated that taking 500mg of ginger twice daily worked about as well as taking 400mg of Ibuprofen three times daily for hip and knee pain related to arthritis. Another study showed that women taking 250mg of ginger, 4 times daily for the first 3 days of their menstrual period, experienced a reduction in pain symptoms by as much as 62%. Diabetes…research is mixed but some studies have shown ginger to low blood sugar levels. One study did show a significant decrease in their blood sugar levels after taking 1g of ginger three times a day for 8 weeks. Vertigo…Ginger has been shown to reduce systems of dizziness and nausea, possibly even preventing motion sickness if taken 4 hours before travel. Preventing some types of cancer…I saved this one for last because of early stage research, but some studies have shown that the ability of the ginger to suppress the proliferation of human cancer cells, especially YYT colon cancer cells. Other research has shown ginger’s ability to prevent or suppress cancer through its antioxidant properties. Ginger is one of the main ingredients in our Jamaican Jerk Seasoning and our Chicken Seasoning . Here’s a healthy, low-salt recipe which uses our ‘very low sodium’ Jamaican Jerk Seasoning. Looking for other ways to use ginger as part of your routine? Try ginger tea. 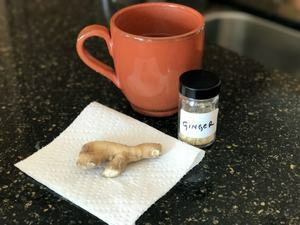 You can either use the root or ground ginger to make your tea. Flavor to taste. If you use the root, just cut a few small slices to make tea. For even more flavor, allow the slices of ginger to soak in water overnight and then just heat it up when you’re ready for tea. It’s great as a cold beverage as well, especially during the summer months. Use lemon and/or honey to taste. Fresh ginger also adds a nice zest to soup. A little fresh, grated ginger goes a long way and is a great addition to a low-salt diet. Hint: Make your own soup to take control of your salt intake.